And it’s a century! Yes, this is my 100th blog post and the ride has been quite something. These 100 posts have come about in a span of 8 months (with the first post on 2nd Oct 2017) with the planned schedule of Monday-Wednesday-Friday followed on most weeks. In all honesty, I have surprised myself with the dedication and commitment which I have shown in this little corner of mine. I am generally not someone who likes to talk much about myself, which is why you won’t see a lot of personal details in the posts. However, 100 posts is a big deal, eh? So, in the spirit of doing something different, here are 5 things you didn’t know about me. I have always had a nascent interest in writing and as a kid, even had an imaginative story about the origins of Donald Duck printed in a local kids supplement of a newspaper. However, like with a lot of things in life, I didn’t pursue it much back then. While pursuing MBA, I got an inkling about blogs and on a whim started a personal blog called Khyali Pulao, which is a Hindi phrase literally translating to Mental Stew and often used to mean over thinking that doesn’t translate to anything or any action. I wrote off and on and had no idea or interest in making it bigger than a place to put in random written pieces. However, writers’ block was quick to strike and there was little incentive to continue with it, though attempts to revive continued well until recently. I have always been a foodie, especially when it comes to street food or legendary local delicacies. In November 2014, my passion for food, travel, and writing came together in my 2nd blog – Bohemian Foodies. With each post, I used to put in an immense effort with hunting for the place, eating the food, getting my husband to give me pointers for the non-vegetarian specialties (I eat only chicken), photographing it, editing the photos, writing the post and laying it out on the blog. In all honesty, food blogging is more fun and the response I got for the blog was phenomenal. Then the healthy-food phase stuck on to me and my husband and the blog has been dormant for some time now. The number of friends who have enquired about it is a huge validation of the fact that someday when I have more time to run multiple blogs, Bohemian Foodies is one that I need to revive. Had you been curious enough about me and stalked me all the way to my Linkedin profile, you would know that I have done my MBA in Marketing and now have over 8 years of experience working full time in the corporate world, in the retail and financial services industry. I still work as a marketer in one of India’s top 3 private Indian banks. It was in my previous job that I realized my peers and friends know nothing about most financial products. Even with a little extra knowledge, I seemed to know more. Then in my current job, in January 2017, the investment advisory team of the bank organized for a talk by Carl Richards. While I was not really connected to the team, I got the office-wide email and decided to attend the talk anyway. That, for me, was the life-changing moment. Carl talked about his experiences as a financial planner and it was the first time I came across the idea of money being an emotional and a rational subject. He ended the talk by giving his contact details. I was fired up after the talk and emailed him asking if he thought I could make the switch from marketing to financial planning. He replied! The one statement of his that I will remember for life was – the difference between winners and losers is that winners go out and do things. 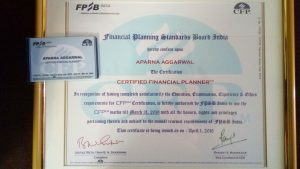 I took his reply to heart and between June and December 2017, cleared all 5 exams to be a Certified Financial Planner. For now, I am still a Financial Services Marketeer with a CFP degree, moonlighting as a Personal Finance blogger. Let’s see where this path takes me. There is a reason why I have stuck to this blog. Gradually, I have realized I often need a push to do things. For a long time, the push was provided by my father but off-late only self-inflicted pushing really works. With a fixed schedule driving me, this blog forces me to think, read, research and create. The blog has also attracted a lot of money conversations directly towards me. Even with a full-time marketing job, this blog keeps me close to my passion of money and using it to achieve financial goals. Funnily enough for a marketer, I am not doing a great job of marketing it. I know I tend to get lost in spending most of the time in creating content. While that is the main reason I started the blog, gradually I need to find the balance between creating and marketing the content and batch writing is a skill to develop in that regard personally. I still remember just how awkward I used to find cold calling when I worked in the Alumni Cell of my MBA college. At my first job, I was often told to call up people, introduce myself and start working. There were often people that I would work with for months and not have met them. That sure got some of my hesitation out. As a person, I will come across as a cheerful and sometimes crazy person cracking bad jokes, with enough confidence now to walk up and talk to strangers as well. However, under all that I am still a private person. I have stopped putting personal content on social media (with only one photo out there from my wedding). I no longer like to put my own photos as Whatsapp display either, considering just about anyone can access it. Even with the people I meet personally, there are very few I confide in. I am extremely close to some of my friends who have stuck on for years, some almost for two decades now. Most importantly, I value my me-time immensely and often find it in my daily commute. I met my husband at my first job post MBA. We were both a part of the marketing team in the retail firm that we worked at. Last month, we completed 4 years of marriage. While I have tried to diligently follow my self-defined discipline of the 3-posts a week, it is beginning to take a toll on me. For me, the quality of the content is important and so is finding the time to get it out to enough people. So, I have decided to do away with the Wednesday post to bring down my weekly posts to 2, one on Monday and one on Friday. 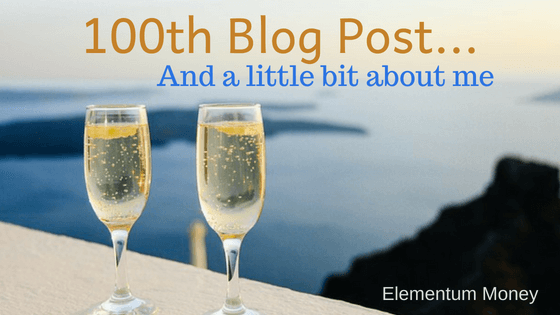 That still means 100 blog posts every year! With Elementum Money, I have maintained that it is a place which makes you think. Till now, the thinking was limited to money. But our relationship with money can often be improved when we are a better version of ourselves. I have become a huge reader of productivity, motivation and personality blogs. However, I see very few scientific blogs like the ones I admire, in an Indian context. Starting this week, Mondays will now continue with money posts and Fridays will have the new section of self-development. All Friday posts will end with a note on actions that can be taken on the basis of the self-development content in the post. The posts will still have a mix of guides, listicles, blog reviews and book learnings. Congratulations on achieving the feat. Consistency is the first step to success. Congratulations! 100 posts is huge! You are going great. Now off to check out Bohemian Foodies! That’s great congrats , but what happened to your previous blogs ? You closed them ? That’s a lovely post Aprana – here’s a question. Do you make much use of the CFP training?